Female car ownership is now at record levels, hitting 11.8 million in 2017, according to new Motorparc data released today by the Society of Motor Manufacturers and Traders (SMMT). 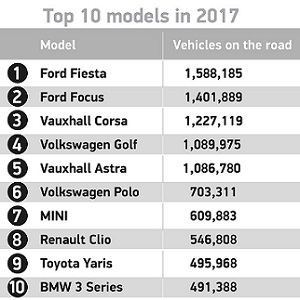 The UK’s biggest automotive analysis shows the changing face of Britain’s cars – and their keepers. Latest analysis shows the number of cars registered to women has surged by more than a fifth (21%) since 2007, with women now owning more than a third (11.8m) of the UK’s cars. This compares with a 10% increase in the number of men purchasing one in the same period. 17.8m cars were registered to men in 2017 and there are now 34.7 million cars on UK roads, up 12% across the past 10 years. The data also shows the diversity of British car ownership, with some 1,500 model ranges and 65,000 different model specifications in the parc, compared with 1,200 and 56,000 10 years ago. More than a fifth (22.5%) of cars on UK roads were less than three years old in 2017, helping improve air quality and CO2 emissions with the latest low emission technology. Elsewhere, smaller models continue to make up the bulk of the UK’s car parc – mini, supermini and lower medium together taking 62.3% market share in 2017, up from 60% in 2007. Across all car segments, however, the most dramatic shift has been in the rise of dual-purpose cars. Their number has increased more than 90% during the past decade with some 3.5 million on the road in 2017, representing 10.2% market share, up from 6.1% in 2007. Conversely, upper medium models have seen the largest fall in popularity, declining -27.0% – equivalent to roughly 1.5 million cars. The data also shows consumers’ changing car colour preferences, with the trend to monochrome seeing brighter colours fall out of favour. In 2017, silver/aluminium was the most commonly seen car colour on the road, followed by black and blue. Data from 2007 reveals that blue was then the top choice, followed by silver/aluminium and, in third place, red – a colour that has now fallen out of the top five completely, along with green, which was previously the fifth most popular shade.